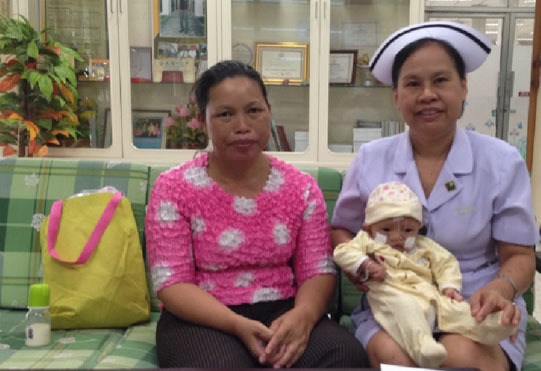 TF decided to support Tawanchai Foundation’s initiative to implement cleft lip and palate registration in 75 hospitals. The registry would like to establish a system that will allow government officials to see the scope of the incidence of cleft lip and palate. It will also help medical staff to collect statistics for research and ensure that timely surgery and on-going rehabilitation is provided. Recently, our partner conducted interviews with parents and staff to receive feedback about the registry. “When healthcare providers told me that my girl had a cleft palate and showed me, I felt frightened and sad. I had never seen that before. No one else in my family had it. Therefore, I was afraid that it could not be treated. I worried that my child would not be able to be breastfed and would not be able to talk like others. But, a nurse in the labor room took her basic information and entered my child into the cleft birth registry. Then the nurse referred my child to Srinagarind Hospital. The first visit was about breast feeding. We went to the lactation clinic at Srinagarind Hospital. We were admitted to stay in the hospital in order to receive training about breastfeeding and got a physical examination by a team of pediatricians and surgeons. After that, my child was referred to a multi-disciplinary team. They told us that our next visit would be on November 6, 2013 to have a hearing examination and to determine if my child would be ready to get her surgery. Suteera Pradubwong, the Nurse Coordinator, then interviewed the mother of a 5-month boy with complete cleft lip and cleft palate. They live in Kalasin Province. “After I gave birth, I felt very frightened and sad. I was worried so much about everything because no one in my family has had this happen before. Initially, my husband’s relatives seemed not to accept my child. The nurses at Kuchinarai Hospital told me that this condition can be cured and they referred my case to Tawanchai Cleft Center. I met with the plastic surgery team and nurses at Tawanchai Cleft Center at Srinagarind Hospital. I received suggestions about the cleft and its treatment guidelines, as well as the preparation required before surgery. I received a gift set, a handout, and also a phone number that I can contact when I have any questions.